In these hours, You will learn how to put away sinful anger and become a channel for God's holy anger. How do we pray in the will of God? Why should we ask for what He already knows we need? What is intercession? 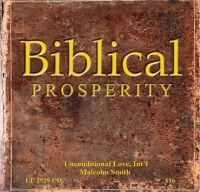 "...that you may prosper, even as your soul prospers..." Malcolm takes this prayer of John and explains what it means to experience true Biblical Prosperity.